Neck pain can be caused by various situations like injury, stress or chronic illnesses and conditions like cervicogenic headaches and cervical radiculopathy. 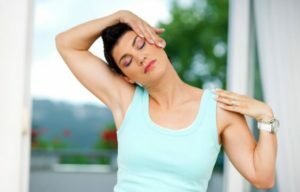 No one should have to deal with neck pain since it can greatly affect one’s life. That’s why it is important to find and address the root cause of the neck pain. Before getting to the root cause of the problem, you first have to address the ache itself. This is where neck exercises come in. They will provide the much-needed pain relief and enable you to move your neck with ease. Our physiotherapists from Turramurra Sports & Spinal Physiotherapy recommend these exercises to help relieve your neck pain. These exercises will also help restore mobility to your neck. We will divide these exercises into two categories, exercises to stretch and increase mobility and exercises to strengthen the neck muscles. As the name suggests, these are exercises to help keep your neck mobile and flexible. This exercise involves bringing one’s chin to their chest ( flexion) and looking up to the ceiling (extension). You slowly touch your chin to your chest and bend your head back as far as you can. This exercise should be repeated at least five times to yield results. With this exercise, you bring your left ear to your left shoulder as far as you can and do the same on the right side as well. This should also be done five times. Refrain from rotating your head during this exercise. Turn your head to the left and try to bring your chin over your left shoulder. Do the same on the right side and repeat for five times. Each time you should hold that position for five seconds. Another exercise involves standing with your feet wide apart and placing your hands behind your head. Bend the upper part of your body from side to side. You can try to reach your elbow to the ceiling. Do this five times. Basically, what these exercises do is make your neck stronger. These particular exercises are referred to as isometric exercises. Isometric Hold – Put your palm on your forehead and push both your forehead and palm against each other as if you are resisting motion. Hold for five seconds and repeat this process three times. The second exercise involves placing your hand against one side of your head. With your hand still in the same position, try to bring your ear to your shoulder while resisting this motion. Do this on the opposite side as well. Hold this position for five seconds and repeat the process five times. The third exercise involves cupping both hands against the back of your head. Try to push your head backwards while resisting this motion. Hold for five seconds then relax. Finally, put your left hand against your left temple and try to turn your chin to your left shoulder, while resisting this motion. Do the same process on the right side. Hold for three to five seconds and relax. Neck pain can hinder your day to day life and negatively affect your health as well if proper action is not taken on time. If you no longer want to experience neck pain or can no longer stand those cervicogenic headaches call 9144-1510 now to schedule an appointment with one of our physiotherapists.